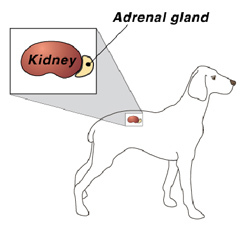 Whether your pet has been diagnosed with an endocrine disorder, or has symptoms you are concerned about, we can help. Although your pet’s veterinarian may begin by recommending routine blood work, we also offer an array of specific and precise tests to determine if your pet is suffering from an endocrine disease such as Diabetes, Cushing’s Disease, Addison’s Disease, Hypothyroidism, Hyperthyroidism, and more. Talk to your veterinarian today if your pet has any of the following symptoms: increased thirst or urination, increased appetite, decreased energy, or hair loss that could be signs of an endocrine disorder.